Published: Aug. 28, 2015 at 04:41 p.m. Updated: Aug. 28, 2015 at 05:44 p.m.
Did your fantasy football question not make this week's Mailbag? You can still get an answer! Submit it to Fantasy Genius and have your question seen by millions of fantasy fans just like you! @MattHarmon_BYB I have the 12,13 pick and might have a choice of luck, dez, Odell, and Julio... Which combo should I take ? I'm not going quarterback at all in the first or early second round of any draft (yes that includes six point-per-passing touchdown leagues too). Luck has a tremendous ceiling this year, and going early quarterback can work out for you, but you increase the odds of busting at every other position when you do it. The draft gets much harder. So, in this scenario, I'm definitely going WR/WR at the Round 1-2 turn. I'm sky-high on Odell Bekcham Jr., but the same is true for Dez Bryant and Julio Jones, as previously noted. I don't think you can go wrong with picking two among those three at the first turn. @MattHarmon_BYB @NFLfantasy besides Gronk, are there any other TE that sets themselves up for a standout fantasy year. I've publicly stated that I'm all in on Travis Kelce this season. The Chiefs just signed Jeremy Maclin, of course, but don't rule out Kelce leading the team in targets. From a measurables and athletic standpoint, Kelce is right on par with Rob Gronkowski. Personally, I rank him as the second tight end this year after Gronk, and am much more eager to take him in the fifth round, than Jimmy Graham in the third. Moving a little later, I like Jordan Cameron's draft value. Humor me for a second, but this is a player that was going in the third and fourth round of last year's drafts, and now he's in a superior offense, with a way better quarterback. Of course there's the concussion issue, and that is very real, but this four round discount is still insane value when you factor in the improved situation. Lastly, Eifert is the only other candidate for a standout season. He's a tick below the three tight ends mentioned here in terms of athleticism, but is no slouch there. He should be the second most targeted player in Cincinnati behind A.J. Green. If he falls to the double digit rounds, that's thievery for you. @MattHarmon_BYB @NFLfantasy what round do you take a chance on Arian Foster? With the news that he's far more likely to only miss two to four games, and will not hit the IR designated to return list, I'm keen on taking Arian Foster again. However, as I often preach, it really depends on how you've constructed your roster prior to taking him. If I have at least one secure RB1 in tow before Round 4, I'll start thinking about him there. However, the fifth and sixth round seem like the sweet spots. Should he fall to the seventh round, it's a no-brainer, but that will probably happen less and less as we get closer to the season. One caveat here: if you employ a Zero-RB strategy (where you target pass catchers and stud quarterbacks early whole ignoring running backs), write Foster in pen for your fifth-round pick. The bust rates at that point are crazy high for running backs, and no one you can take there or after can change your season like Foster. @MattHarmon_BYB @NFLfantasy Which side of this trade do u prefer Team1: Antonio Brown. Team 2: Julio Jones and Joseph Randle. I love Antonio Brown, and think he's the WR1 for fantasy this year, but I like Team 2. Jones is a strong candidate to lead the NFL in targets, and passing Brown for that WR1 spot is well within his range of outcomes, in both PPR and standard leagues. It's certainly worth an argument that Brown for Jones is a lateral move. Adding Joseph Randle is nice icing on an already fine cake. We don't have total clarity on how this Dallas backfield will shape out, and likely will not at any point until after Week 1 at the earliest. However, Randle is the guy they've backed throughout the offseason, and Dallas kept him through some peculiar off the field trouble. I'll take the risk on him for a big reward if he holds that job behind their monster offensive line. @MattHarmon_BYB @NFLfantasy When is it a good time to draft QBs in a 10 team, PPR, two starting QB league? In typical leagues, I like to wait as long as possible to select my starting quarterback, unless a strong value presents itself mid-draft. However, I'll pony up a little for one of my two starters in a 2QB league. Don't go crazy and feel like you have to grab one of Andrew Luck or Aaron Rodgers in the first round; the relative value of the position in relation to running back and wide receiver is still diminished despite the need to start two. Try and gauge where your league is going to start a run, and a grab a mid-tier QB1 (Eli Manning, Ben Roethlisberger, Tony Romo, Ryan Tannehill) in the middle of that. Those moments usually come around the fourth round, because most go crazy for the position. Don't fall for the trap, and instead attack the value created at running back and wide receiver. For that second spot, you can get away with a Carson Palmer late in drafts, or just stream the position between two low-end NFL starters, such as a Ryan Fitzpatrick or Tyrod Taylor. Signal-caller values end up skewed in 2QB leagues, so you can zig while others zag for good values. Just be careful to not wait too long. @MattHarmon_BYB @NFLfantasy mark ingram or justin forsett? I'll use the "it depends what format" copout here. In PPR leagues, I have total clarity in preferring Forsett. The Ravens veteran running back was a top 10 running back in PPR last season, and little has changed since then. The team spent little to no resources to bring in competition, and gave him a fine contract extension. With Marc Trestman in town, his reception floor is locked in at around 60 catches, and the offensive coordinator's history suggests Forsett could see far more. In standard leagues, I might still prefer Forsett, but there's a strong argument for Ingram. After a breakout 2014 season, Ingram is locked in as the early down banger in New Orleans. Every move the Saints made in the offseason indicates they're moving towards a backfield-centric offense. They'll still move the ball efficiently, even if the passing ceiling is lower than in previous seasons, and that means plenty of opportunities for touchdowns. @MattHarmon_BYB @NFLfantasy your preferred spot to draft this year? Sticking with the theme of the last question, I like having one of the last picks in the first round, and selecting at the turn this year. This is not a top heavy group at the top this year, but a strong deep early-round bunch. 2015 presents great opportunity at the turn to grab two week-in-and-week-out fantasy anchors. You can go Zero-RB and obtain two high-end WR1's, as in the previous question, or you can obtain one of the RB1's that falls, and still compliment with one of those receivers. Starting a team with C.J. Anderson or DeMarco Murray/Julio Jones or Calvin Johnson is a real possibility this year at the Round 1-2 turn. @MattHarmon_BYB @NFLfantasy Standard scoring, with keepers of J Hill and R Cobb, rank these for next pick: M Lynch, A Brown, D Thomas. Since its standard scoring, I'd rank them Lynch, Brown, Thomas-exactly the order you had them. See, sometimes your subconscious mind is your best guide in fantasy football. You don't really need us, just don't tell my bosses that. @MattHarmon_BYB @NFLfantasy do you advise owning teammates, more specifically Cooks and Ingram? I do think owning teammates is perfectly viable. How many people won championships if they took Demaryius Thomas in the first round and Emmanuel Sanders in the sixth last year? The Saints may not be the prolific offense we're used to seeing, but there are several units where I want to stack teammates. A Le'Veon Bell/Ben Roethlisberger/Martavis Bryant team can score points in bunches. Same with a fantasy squad littered with Colts players. Far too many fantasy owners make mistakes when they pay too much attention to extraneous factors in draft like bye weeks and avoiding drafting too many players from one offense. Just grab the players who will score the most points, especially ones from great offenses. 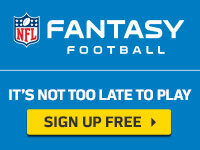 @MattHarmon_BYB @NFLfantasy who will be the CJ Anderson of the 2015 fantasy season? That's a tough call, as not many were predicting an Anderson breakout last year. Their mystery is part of what makes them. However, if I were to name the under the radar running back who has a 2014 C.J. Anderson-like season in his range of outcomes, it's Khiry Robinson. Mark Ingram and C.J. Spiller have better track records than Montee Ball did, but they've both disappointed in the past, as well. Not to mention, Ingram and Spiller frequently deal with injuries, and are no strangers to the training room. If one or both misses time, Robinson is in line for a big opportunity. He has the vision and power to thrive in Ingram's stead, and the soft hands and moves in space to fill-in for Spiller as the designated pass catcher. These situations are always long shots, but try to track talented backups, behind somewhat unsettled starters in good offenses. That leads you right to Khiry Robinson. @MattHarmon_BYB @NFLfantasy Would you trust Carlos Hyde as a RB1 in a 12 team league? I would not, and frankly I'm not even interested at an RB2 asking price in PPR. Hyde is a talented player, and could score multiple touchdowns in a few games. However, I have a strict fantasy rule of never overpaying for two-down running backs on bad teams, and that's exactly what Hyde is. We know the 49ers were gutted in the offseason with several catastrophes, and the team signed Reggie Bush to supplement Hyde. Bush has long been one of the best pass catching running backs in the NFL, and he'll be on the field when the team gets down. I like Hyde's long-term potential, but too many over-inflated his fantasy stock this offseason. @MattHarmon_BYB @NFLfantasy Is Gio's value this year tied strictly to being Hill's handcuff or is he in the flex/RB3 conversation? It hurts to say, as a long-time fan of Giovani Bernard going back to his UNC days, but I'm completely off him this year for fantasy this year. This team clearly transitioned to a Jeremy Hill-centric offense, and that's the formula they'll win with. I still think Gio plays a role, and he is a quality player, but I don't think he offers much more than a Danny Woodhead in fantasy, given his situation. Given the drastic difference in their draft positions, I'm fading Bernard. If he ever lands with a different team, I'll be interested once again. @MattHarmon_BYB who are some great fan duel week 1 players? John Brown is a great value deep down the wide receiver list. The Cardinals play the Saints Week 1 in a game sure to feature plenty of scoring. Joseph Randle also presents a sweet proposition this week. Of course, there's risk sicne we don't have total clarity on the situation, but you have to take chances on FanDuel. Jordan Matthews is another strong value play, and his contest against the Falcons could be the highest point total of the opening week. He's listed behind several receiver with less appeal than him. Greg Olsen is underrated on FanDuel. His team faces the Jaguars, and he's a safe play with Kelvin Benjamin on the shelf. Olsen will see plenty of targets. @MattHarmon_BYB @MarcasG @NFLfantasy Hey @CutonDime25 - Matt & I disagree on how good you'll be this season. What are your thoughts? Wow. I know we just met, but I'm still surprised Shek would throw me under the bus, and snitch on me publicly after a private conversation about why I'm down on Bills running back LeSean McCoy at his current ADP in fantasy. I wasn't expecting such heat here at NFL Media. Of course, McCoy never responded, because I'm sure he doesn't care what I think, nor should he. I'm just a guy with a Twitter account. Matt Harmon is an associate fantasy writer/editor for NFL.com, and the creator of #ReceptionPerception, who you can follow on Twitter @MattHarmon_BYB. If he did not answer your question here, check back with him on Twitter, and he'll get to it.